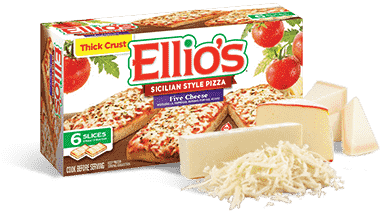 This five cheeser is a splendid blend of 100% real mozzarella, parmesan, Romano, fontina and Asiago cheeses; our crazy, savory sauce, all topped on a fresh, crispy, crunchy crust. This melt-in-your-mouth combination keeps on melting. Preheat to 425 F. To enjoy a crispy crust, put pizza directly on oven rack. Bake for 11-12 minutes or until cheese is melted and crust is golden brown. If you prefer a softer crust, place pizza on a nonstick baking sheet. Bake 12-13 minutes. Preheat to 425 F. To enjoy a crispy crust, put pizza directly on oven rack. Bake for 13-14 minutes or until cheese is melted and crust is golden brown. If you prefer a softer crust, place pizza on a nonstick baking sheet. Bake 14-15 minutes.